Habit: Annual, perennial herb, woody vine [shrub], occasionally aquatic. Leaf: generally basal and cauline, alternate or opposite, simple or compound; petioles at base generally flat, occasionally sheathing or stipule-like. Inflorescence: cyme, raceme, panicle, or flowers 1. Flower: generally bisexual, generally radial; sepals 3--6(20), free, early-deciduous or withering in fruit, generally green; petals 0--many, generally free; stamens generally 5--many, staminodes generally 0; pistils 1--many, ovary superior, chamber 1, style 0--1, generally +- persistent as beak, ovules 1--many. Fruit: achene, follicle, berry, +- utricle in Trautvetteria, in aggregate or not, 1--many-seeded. Genera In Family: +- 60 genera, 1700 species: worldwide, especially northern temperate, tropical mountains; many ornamental (Adonis, Aquilegia, Clematis, Consolida, Delphinium, Helleborus, Nigella). Toxicity: some highly TOXIC (Aconitum, Actaea, Delphinium, Ranunculus). Note: Taxa of Isopyrum in TJM (1993) moved to Enemion; Kumlienia moved to Ranunculus. Habit: Plant +- woody vine; occasionally dioecious. Leaf: generally 1--2-pinnate, cauline, opposite; petiole generally tendril-like; leaflets ovate to lanceolate, generally irregularly 2--3-lobed or coarsely toothed, occasionally entire. Inflorescence: 1-flowered to panicle, axillary [terminal]. Flower: unisexual; sepals generally 4, free, petal-like, white to cream [brightly colored]; petals 0; stamens many, free; pistils 5--many. Fruit: achene, each generally with elongate, feathery style. Species In Genus: 300 species: worldwide; Clematis terniflora DC., cultivated. Etymology: (Greek: twig) Note: Clematis drummondii Torr. & A. Gray undocumented for California. Leaf: leaflets generally 3--5, +- 3-lobed, generally toothed, largest generally 1--3.5 cm. Inflorescence: 1--3(12)-flowered. 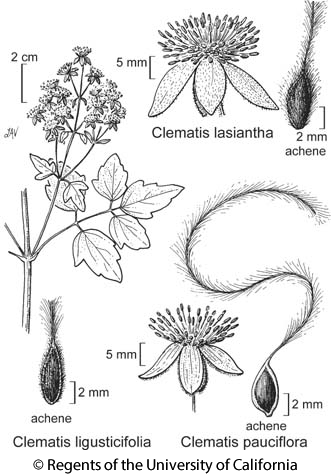 Flower: sepals 7--12 mm, hairy abaxially, glabrous adaxially; stamens 30--50, 6--12 mm, +- = sepals; pistils 25--50. Fruit: body glabrous. Ecology: Dry chaparral; Elevation: < 1300 m. Bioregional Distribution: SW, DMtns (Little San Bernardino Mtns); Distribution Outside California: Baja California. Flowering Time: Jan--Jun Note: Plants +- intermediate to Clematis lasiantha in SW.
Citation for this treatment: James S. Pringle & Frederick B. Essig 2012, Clematis pauciflora, in Jepson Flora Project (eds.) Jepson eFlora, http://ucjeps.berkeley.edu/eflora/eflora_display.php?tid=19693, accessed on April 21, 2019. SW, DMtns (Little San Bernardino Mtns); Markers link to CCH specimen records. Yellow markers indicate records that may provide evidence for eFlora range revision or may have georeferencing or identification issues. Purple markers indicate specimens collected from a garden, greenhouse, or other non-wild location.